"The whithering lotuses in autumn wind inspire painters. When only broken withered boughs are left, the forms and reflections of various trunks and branches on the mirror-like calm water form geometric abstract pictures. 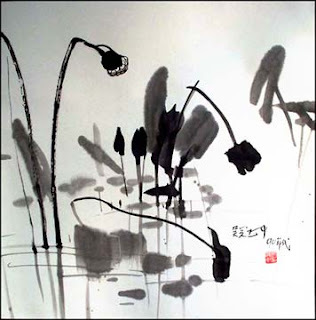 Pictures of lotuses abound in traditional chinese paintings, but the stylized pictures fail to excite me. In the lotus pond, however, the big and small leaves are interwoven, and the curves and straight lines cross each other in an intricate manner. The reflections are also among the leaves, blurring the distinction between what is above the water and what is underwater. It seems that I am an insect under a leave, lost in the maze of flowers, and the undulation of reflections, and the decorative effect of drooping lotus pods. In this picture, I used bright and thick colors as if to treat myself to a sumptuous dinner..."
Wu Guanzhong, National Art Museum of China.